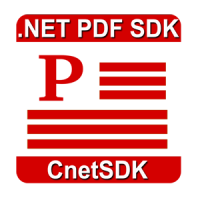 CnetSDK .NET PDF Library SDK is a standalone PDF library component for .NET windows and web applications development. This comprehensive .NET PDF lib component enables developers to read, create, edit, process, extract, convert, combine, compress and protect PDF document (pages) in various .NET applications. It is quite easy to test and use CnetSDK .NET PDF Library SDK. And this online guide will help you have a quick start. CnetSDK .NET PDF Library SDK is a comprehensive .NET PDF editor library that may meet almost all your PDF editing and modifications requirements for .NET, C#, VB.NET, ASP.NET, and WPF applications development. It works as .NET libraries, like PDF editor, PDF creator, PDF converter, PDF compressor, PDF extractor, and PDF components for PDF protection, annotation, combination and more. This standalone PDF library component for .NET can be easily integrated into your .NET projects by simply adding a project reference to it. Please firstly download the free trial version of CnetSDK .NET PDF Library SDK from the download button above. And then, you may use the PDF editor library dll (CnetSDK.PDF.Library.Trial.dll) for your application. For the free trial package, a watermark (CnetSDK) will show on PDF document page randomly. To remove the watermark, please make an order for a license of CnetSDK .NET PDF Library SDK. In the download package, you will find a demo project and it illustrates how to use CnetSDK .NET PDF editor library. You may directly refer to it and have a quick evaluation. To be more specific, you will see .NET demos for how to load, create, edit, convert, compress, combine, split, annotate, extract, protect PDF document and more .NET PDF processing and modifications. CnetSDK .NET PDF library component enables you to create a new PDF document and generate PDF from the image file and HTML. CnetSDK .NET PDF library component enables you to edit PDF document pages. You may easily rotate, delete, and insert PDF pages with specific .NET APIs. It is easy to use this PDF library control for .NET to add bookmark, text, image, and various annotations to PDF document pages. In addition to adding content to PDF file, you can also use this mature PDF editor library control to extract images and text from PDF document pages. If you want to combine PDF files together or split a large PDF file in .NET applications development, our .NET PDF control library can help you. If you need to reduce the size of large PDF documents and keep its original quality, you may directly refer to the demo code for how to compress large PDF files. It is necessary to add or remove protection to confidential PDF for restriction permissions. CnetSDK PDF editor library for .NET provides the methods to encrypt and decrypt PDF.